A futuristic city in the middle of the desert could be a hub for further developing Scottish low carbon technology, First Minister Alex Salmond said this week. Speaking during a visit to the Masdar Institute of Science and Technology, Abu Dhabi’s initiative to advance the development, commercialisation and deployment of renewable and alternative energy technologies and solutions, the First Minister said: “Scotland is a world renewable energy champion, and is continuing to play a major role in driving the global adoption of renewable sources of power, innovations in grid technology and R&D in wind turbine development. “The innovative work being undertaken here at the Masdar Institute is further indication that other nations are recognising the need to move to preserve the quality of the natural environment, which is one of the major global concerns facing us today, and one of the most critical challenges of the 21st century. During his visit, the First Minister met with senior Masdar officials including: Dr Sultan Al Jaber, CEO, Masdar; Frank Wouters, Director, Masdar Power; Alex O'Cinneide, Director Masdar Capital; Trevor Nash, Director Venture Capital, Technology, Strategic Partnerships and Sustainability, Masdar; Dr Fred Moavenzadeh, President, Masdar Institute and Professor Joseph Cecchi, Provost and Professor of Engineering, Masdar Institute. 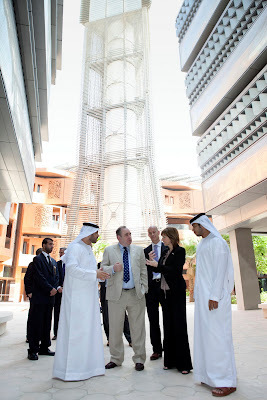 The First Minister took a tour around the City to view the Masdar Institute, one of the world’s most sustainable campuses for graduate level students and the first research-driven institution in the region dedicated to finding solutions to the challenges of future energy and sustainability. He also visited the Masdar 10MW photovoltaic power plant which provides the power for the low waste, low carbon City. The Masdar Institute building has been designed to minimize water consumption by using high efficiency appliances, low-flow showers, highly efficient laundry systems, a water tariff that promotes water efficiency, smart water meters that inform consumers of their consumption and low-water use landscaping. The Masdar Institute also seeks to be a leading renewable energy and clean technology player, by providing a test bed for the world to develop commercially viable, sustainable energy solutions, providing applied research for the four corporate arms of its allied Masdar group and the UAE as a whole. Masdar is Abu Dhabi's multi-faceted initiative advancing the development, commercialisation and deployment of renewable energy technologies and solutions. The company serves as a link between today’s fossil fuel economy and the energy economy of the future - developing the ‘green print’ for how we will live and work tomorrow. Backed by the stability and reputation of the Mubadala Development Company, the strategic investment company of the government of Abu Dhabi, Masdar is dedicated to the emirate’s long-term vision for the future of energy. The First Minister was recently awarded the third South Australia International Climate Change Award by the South Australian Government to recognise and encourage leadership by regional governments in response to the challenges of climate change. Previous winners have been former California Governor Arnold Schwarzenegger in 2009 and Quebec Premier Jean Charest in 2010.